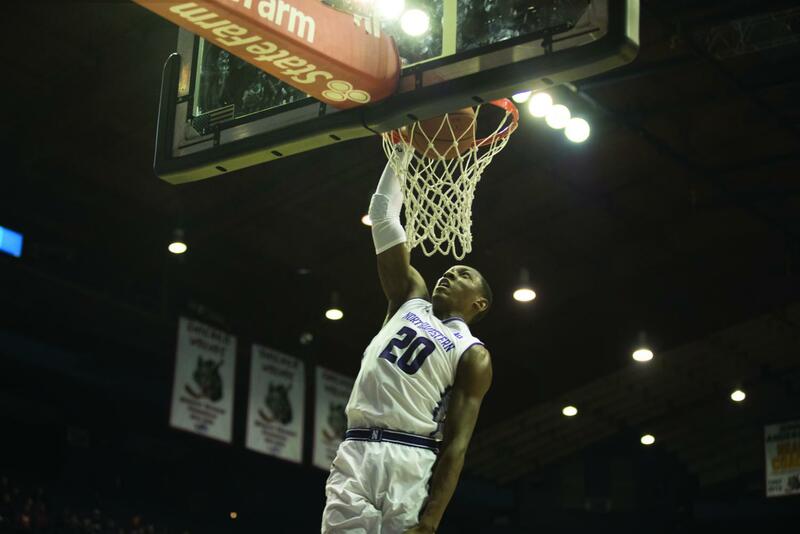 Scottie Lindsey finishes a layup.Northwestern lost its fourth straight game Monday as the Wildcats saw another early lead fall. It was an all-too familiar position, coming just over 48 hours after Northwestern blew a 27-point lead and suffered a second-half collapse in a 65-60 loss to No. 2 Michigan State. This time, the Wildcats (15-14, 6-10 Big Ten) were leading Maryland (19-11, 8-9) by three with 9:44 left in the second half of Monday night’s home matchup, and what had been an 11-point lead early in the half was already dwindling. Just when NU needed to make a big run rather than give one up, it all started to fall apart. Maryland hit three consecutive layups in less than a minute and sank a three-pointer to go up 58-54 and did not lose the lead. That poor second-half performance doomed the Cats for the third straight game in Monday’s 71-64 loss to the Terrapins. NU shot 38 percent from the field in the second half against the Terrapins after shooting 45 percent and sinking eight threes in the first half. The late collapse represented a continuation in the recent trend of dreadful second-half performances from the Cats. NU has not shot above 40 percent from the field in a second half since a Feb. 6 win over Michigan, in which it shot 45 percent from the floor and 50 percent from deep in the latter period. The struggles began in a 67-58 overtime loss to Rutgers on Feb. 13, when the Cats shot 27 percent from the field in the second half and went 1-for-8 in the overtime period, and worsened when NU shot a ghastly 12 percent from the floor in Saturday’s loss to Michigan State. The Cats have averaged 6.5 field goals in the second half across their last four games, a low number compared to the 14.3 field goals they have averaged in the first half across those games. Junior center Dererk Pardon said that the Cats’ priority at this point is to put the past games behind them and work on closing out strong, both in games and in the regular season overall.